The Scale Master Pro by Calculated Industries is an unbelievably helpful aid in take-offs for any project. Whether you’re a contractor, estimator, engineer, architect, landscaper, excavator, fencing specialist, telecommunications, cable, pavers, concrete contractor, plumber, HVAC contractor, electrical contractor, or work in any other field in which a fast and accurate takeoff from plans and blueprints is essential, this tool will make it happen. 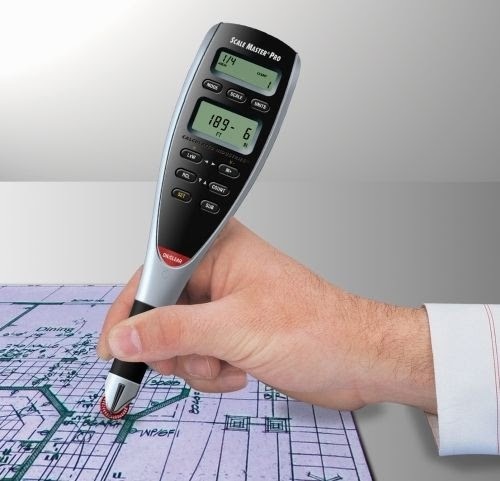 Easier to hold and maneuver across plans, maps, drawings, and blueprints than its predecessor the Scale Master Classic, its newly designed dual LCD also makes it easier to read. It has 72 built in scales, 39 Imperial (ft/in) and 33 metric, making fast and efficient linear, area, and volume estimations easier than ever before, allowing you to get the estimate done faster than ever before. With 6 custom user-set scales the ability to adapt to any estimating, bidding, and planning whether it be in architectural, engineering, or civil-scales, in the field or in the office. With this you can calibrate the scale to any plan which is then saved for future use, making it perfect for dealing with out of scale plans. You can quickly switch between linear and metric modes while there is also an integrated lock which keeps the setting you desire. In addition the Scale Master Pro will calculate rectangular areas and volumes by rolling out the dimensions of length, width, and height to calculate square or cubic measurement. It will measure in your desired unit of measurement, decimal feet, feet-inches, decimal inches, yards, millimeters, meters, kilometers - including square and cubic formats of each – in addition to rolling distances in either direction as fast as you can roll them, subtracts if you roll too far, count items such as studs, outlets, etc. and accumulate them in memory. All of these features provide a tool that will increase speed, productivity, accuracy, and profitability, with an amazing 2-4% accuracy dependent upon operator accuracy. Included are a hard cover protective case, a complete user’s guide, (2) long-life lithium batteries (cr-2032), and a full one-year limited warranty. For additional information and visual demonstration of functionality see these videos by Calculated Industries, shown is the Scale Master Pro XE but functionality is very similar.